That’s me there at 3:50, working with Alex in the early days of Rasa. I spent almost two years with Rasa, a startup making open source tools to build AI assistants. I joined them when we were only 6 people. My official job title was Operations Manager, which meant that I was responsible for anything to do with taxes or finances, all HR matters, everything office related and most of the things that did not fall into anyone else’s field of responsibilities. Additionally, I designed branding and marketing assets for the company, maintained their website and occasionally planned events (like team events or meetups). Meet the new Rasa mascot: Sara! She looks super badass with her shiny black feathers and Rasa purple coloured accents, but also has a cute and friendly face. Her eyes are big because she's curious as heck and her beak makes it look like she is a very happy little camper. She's excitable, enthusiastic and talkative. Sara is a raven (maybe her ancestors were cockatoos, but it's a secret). Ravens are known for being extremely intelligent - they can use tools, hold grudges and solve riddles. Sara's hobbies include collecting shiny things, cawing loudly, long walks on the beach and machine learning. She enjoys a good chat, being helpful and spreading the good news of open source software all across the world. Apart from their regular Berlin Bots Meetups, Rasa occasionally held events for their contributors. One of them was the Rasa Summit, with 70 attendants from all over the world. I organized food and seating and designed two variants of a logo for the event. The white and yellow one got chosen and printed on a limited edition shirt that we handed out exclusively to attendants of Rasa Summit. The shirts were very popular and are also super stylish and comfortable. I also set up a swag store for Rasa during my time there. It was mainly made so that we could use it to give away merchandise to our hero contributors (people who had made important additions to our open source software or who were working to expand our community in other countries). Occasionally, people would order from it as well, and I was responsible for organizing production, storage and fulfilment. Every six months, Rasa flies in all their employees from all over the world and they get to spend a week or weekend together, doing fun activities like cooking, boat tours, meeting farm animals or hanging out in a jacuzzi at midnight. I was single handedly responsible for planning three of these events, from finding a location for 20 people to stay overnight to arranging food to making sure everything happened on schedule. 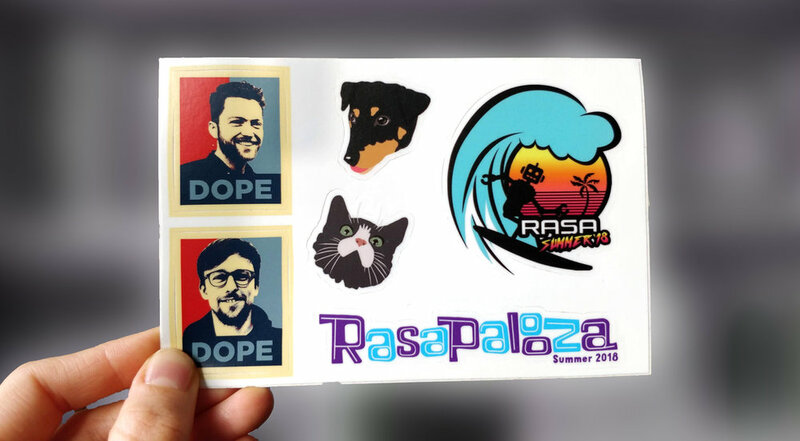 For the summer 2018 team week, I teamed up with the other Rasa designer to make an exclusive sticker sheet for all employees. It features our two founders and their favourite phrase “dope”, the Rasa demo bot on a surfboard and two of our custom slack emojis of employees’ pets. I learned more at Rasa than at any other job - firstly because I had no prior experience in operations, for the first few weeks I had no idea what I was doing. It was great to see that i was able to learn and adapt to this new field of tasks quickly. I became a lot more organized in the process of managing Rasa’s operations, and I learned an enormous amount about running a company and all the admin work behind it. Before, I never thought I would read about taxes without being forced to, but working in operations opened me up to all kinds of new fields and experiences, which was exciting and also fun. I also became a better designer at Rasa. Most of the projects I worked on before I had taken on alone, sometimes with mentorship, but never from another designer. With Elise Boyd as a colleague and mentor I got to grow and learn about teamwork between designers and developers, I discovered new tools, and got to know myself, my strengths and aspirations enough to formulate a better idea for what kind of designer I want to be.